This is the episode where the Punisher reaches peak badass, Karen goes full Ben Urich and Daredevil gets a new mask. He also very cleverly conveniently talks Brett out of arresting him by pitching it as a favor to Brett. Well played, Murdock! More on that and much more below. In a follow-up scene to the massacre we witnessed in the first episode, members of the Irish mob are gathering to bury their own. Finn, a higher up from Ireland, played by the always intriguing Tony Curran, shows up and makes quite an impression. His son is among the dead, and when one of his associates tries to smooth things over, Finn kills him with an ice pick to the eye. As one does. His next order of business is to hunt down the man responsible for killing his son and stealing his money, and the gang proceeds to beating their way closer and closer to the Punisher’s secret lair. Before we cut to the intro, we see Frank watch them exiting his hiding place. He knows he’s been found out. And, they’ve taken back his dog! After the intro plays, we catch up with Matt who is busy getting ready when Karen, wearing all black, shows up at the door. While she helps him with his tie, the two do some bonding and Karen reveals that she used to help her brother with his tie, offering a small peek into Karen’s past life. Curiosity piqued. We next cut to Matt, Karen and Foggy who are attending Grotto’s funeral. The sermon is given by fan favorite Father Lantom who talks about a man, deeply flawed, who had given generously to the collection in an attempt to redeem himself. When they exit the church, Matt stays behind to talk to Father Lantom. Matt admits that he feels guilty for not being able to prevent Grotto’s death, and seeks forgivness for not doing more. We’re back with Frank who is busy slicing open his own arm and wrapping it in gauze. Next to him on the floor is the suitcase full of money he took off the Irish, and his next order of business is to place it in the back of a van. He’s up to something, this guy. 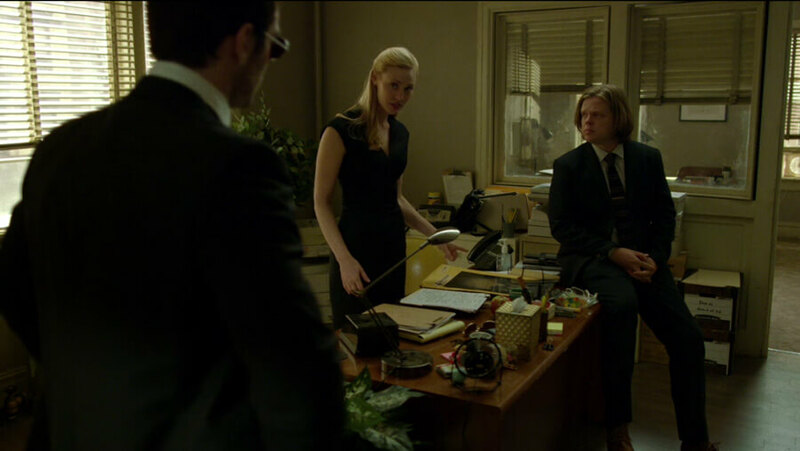 After the funeral, the staff of Nelson and Murdock are back at the office and Karen is giving Matt and Foggy a summary of what she’s been able to find out about the Punisher, paying special attention to the X-ray image of Frank’s skull with a bullet hole in it. Karen suggests that there may be more to the story, and that Reyes could be covering something up. While Foggy goes to answer a phone call, Karen and Matt talk about the Punisher, and Karen admits that she’s intrigued by the story. When she jokes that she may be insane, Matt says she’s compassionate. When Foggy calls Matt over to discuss a case, they suddenly find that Karen is missing and that she’s taken all the files with her. Matt, as Daredevil, decides that he can’t wait any longer for the new mask Melvin is making for him and heads over to his workshop. Melvin, knowing that his one client would be impatient, has indeed finished it and also made him new and better gloves. He also seems to be busy on his own project, sketching away at something we can’t quite see, and showing Matt the new armor that’s hiding under his shirt. A potentially awkward “blind moment” for Matt turns into a nice little Easter egg for us. So, where did Karen go? It turns out that she’s chasing down a lead, which takes her to see George Buck, a nurse who was fired from Metro General. 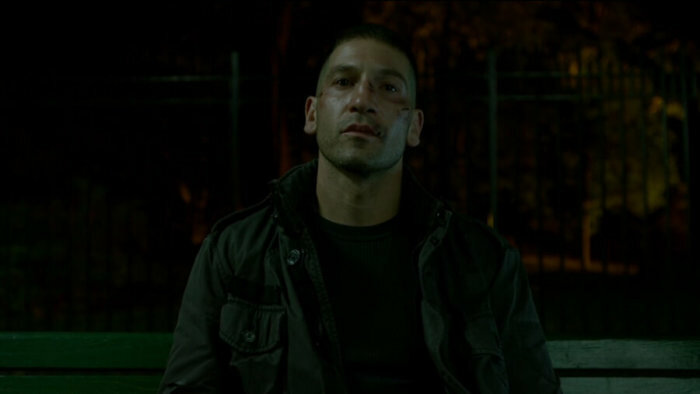 He was on duty when Frank Castle was brought and tells her the story of how Frank basically returned from the dead, on his own, and despite an order to not resucitate. When he came to, he asked George to take him home, which he did, and that cost him his job. 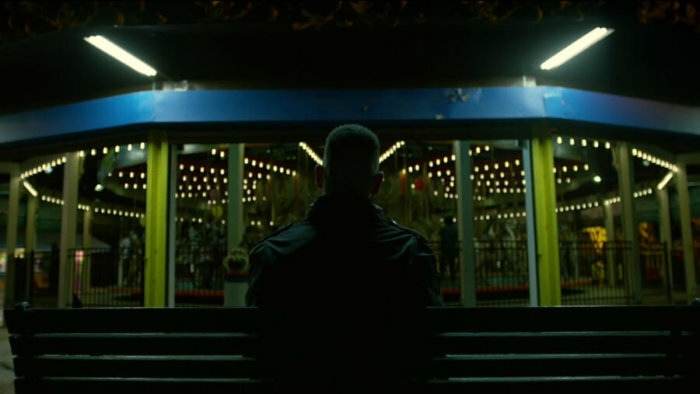 We next find Frank watching a merry-go-round in a park when the music stops, the lights dim, and the people on it go home. It doesn’t take long before the Irish appear to bring him in. Despite putting up a good fight, killing a few people in the process, Frank is overcome by a dose of tranquilizer and taser guns. Brett is processing up a murder scene when Daredevil appears, asking questions about the whether the Punisher was responsible. Brett, somewhat reluctantly, mentions that it’s the Irish are looking for the Punisher. Before Daredevil takes off, he gets a stern talking to from Brett who says that people like Daredevil are part of the problem, that they make the uniform meaningless and send cops chasing crime rather than preventing it. Matt insists that they’re on the same side. 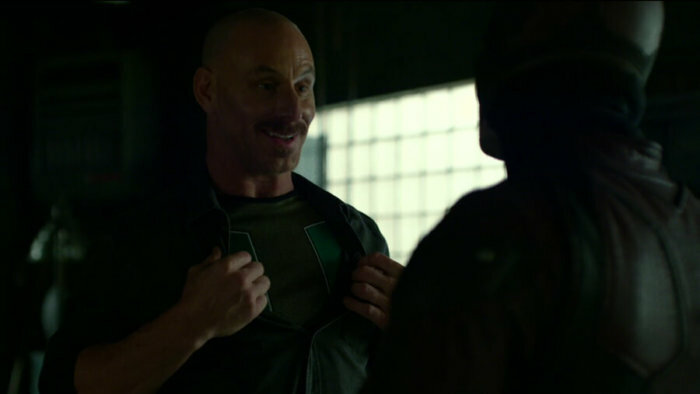 Before taking off, he catches a call on Brett’s radio which gives him the location of the scene where the Punisher was taken down by the Irish. After getting the address from the nurse who was fired from Metro General, Karen is seen breaking into Frank Castle’s house. In subsequent scenes, we see Karen looking around the house and finding all the signs of family life. There is a room where a little girl called Lisa used to live, and photos of Frank with his wife, daughter and son, as well as evidence of Frank’s military service. Everything has been left exactly the way it was. While this is happening, we go back to Daredevil who is now at the scene where Castle was taken. He hears someone alive and breathing, dragging himself out of there. Catching up with him and twisting the man’s wrist, hard, Matt manages to get information out of him. Meanwhile, Frank has come to and finds himself face to face with Finn. He’s tied to a chair and beaten up. Finn wants his money back and is willing to dole out a lot of pain to get it. Frank doesn’t seem fazed, even when Finn takes a drill to his foot. But, fear not, Frank. 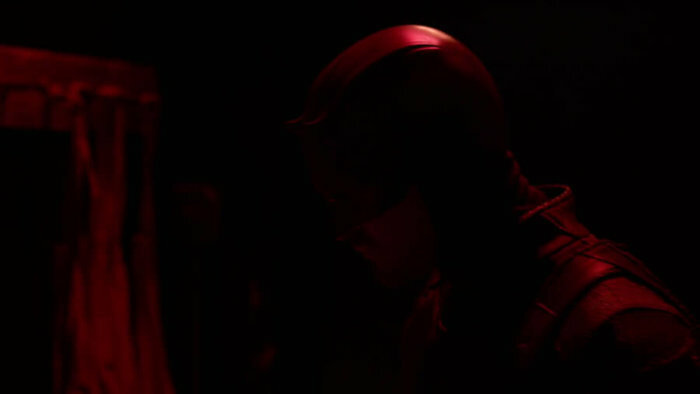 Whether you asked for it or not, Daredevil is on his way and is taking out the guys keeping watch. Frank actually seems to be taking the torture quite well, until they bring in the dog Frank rescued. 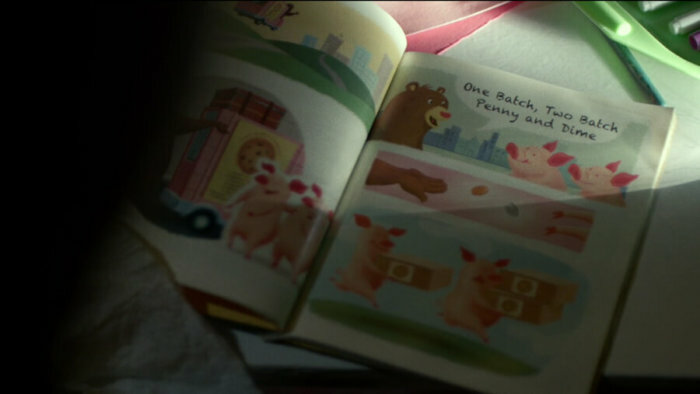 When Finn threatens to torture the dog, Frank yields and tells them where to find the money. Two of Finn’s men are then sent to find the the money and it’s right where Frank said it would be. Of course, there’s a catch and he’s rigged the briefcase full of cash to explode and we see the whole van go up in flames. Just as Finn is listening to this happen over the phone, Frank fishes the razor blade he’s hidden in his arm(! ), and cuts himself free. Play time is over, and none of the people holding him stand a chance. Before shooting Finn’s face off, he unsucessfully tries to get information on who was there the day his family was killed. Just as he’s fighting his way out, Daredevil shows up to help out, though he insists on a no killing policy. When the fighting is over, Daredevil helps the Punisher to a nearby cemetery where he catches his breath. Frank is thinking this might be the end of the line for him. Matt asks him about the rhyme he says before he pulls the trigger. Frank is shocked he can hear that, but finds himself telling Matt the whole story about it being out of his daughter’s favorite book, and then about the last day of her life. Matt sits down and listens. Just as Frank finishes his story, the cops show up. 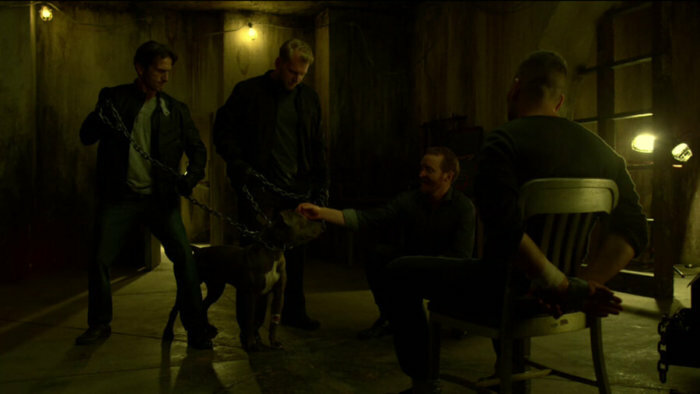 When Brett goes to arrest Daredevil, he tells him to take the collar, make it seem like he was the one who brought Frank in. Brett agrees, and lets Daredevil go (uhm, how “generous” of you Matt). Daredevil insists that people have to know the system works. Matt meets with Foggy and Karen at Josie’s where they watch the news reports about Frank’s arrest. They’re having beers and making a toast to Brett who is now the hero of the hour. While Foggy goes to get them another round, Matt makes a move on Karen. Foggy watches from the bar and seems to be taking it well. When he and Matt step outside, Foggy jokes that he needs to watch out or he might just end up happy. When Foggy goes home, Karen offers to walk Matt home in the rain, and the two share a kiss outside Matt’s apartment. Matt asks Karen if she’ll go out with him, and she agrees. Matt has a big grin on his face when he gets home. Well, until he notices someone in his apartment and identifies her as Elektra. This is easily one of my favorite episodes of the season. Sure, the Irish gang is a bit of a cliché, but I actually like that they are able to hunt Frank down, even if he one-ups them in the end. It reminds us that even very skilled characters, like the Punisher (and Daredevil for that matter), may be difficult to catch or injure, but certainly not impossible. And, it reminds us that the people they are both up against are not complete idiots. This episode is not only big on action – and intense pain – it has some of the better character moments of the entire season. Frank has a great episode (more on that at the end of the post), Karen steps her game up to really start following in Ben Urich’s footsteps – which incidentally includes interviewing people at seaside locations – and Matt finally acts on what has started brewing between him and Karen. To the many people who claim these two have no chemistry, allow me to disagree. It’s also great to see the writers break with comic book tradition and have Foggy be relatively okay with Matt and Karen getting closer. Their love triangle may have been interesting back in the sixties, but we don’t need to see that again here. Matt gets some serious food for thought this episode. It starts with his scene with Father Lantom, where we learn that Matt struggles with guilt and feelings of simply not being or doing enough. When he talks to Brett, he gets another reminder that his way of righting the wrongs around him are not without consequences, some of them negative. Learning that he may be undermining the general trust in the criminal justice system, and the credibility of the police force, is obviously not something that he should be taking lightly as a lawyer. He needs very desperately to believe that what he is doing is in the interest of the greater good. I thought the scene where Brett lets him go at the end was pretty interesting. When Matt, as Daredevil, talks Brett into basically lying in his police report so he can take the credit for the Punisher’s arrest, while also letting him get out of his own arrest, that’s a pretty big step. It’s him bending the system to preserve the system, while realizing fully that there is no way he can fit inside of it. I’m not suggesting he was ever that delusional, but it suggests that some of what Frank had to say to him last episode sank in. He doesn’t wear a badge, what he does can never be officially sanctioned. Not much to comment on this episode, except to say that I really liked the scene where Daredevil and the Punisher are fighting alongside each other and Daredevil grabs behind him to stop Frank from beating someone to death with a hammer. This is a reminder that is able to more easily attend to things happening behind him than the average person would be. And it just kind of looks cool. I think I mentioned the scene where he, belatedly, discovers Elektra in one of the podcasts for the trailers. I’m still thinking that he should have noticed her earlier, but that’s entirely due to the inevitable smell of her which I think would be fairly noticeable. However, I do like that they’re not treating Matt’s senses as infallible, or that they have it appear as if he’s always walking into a lit room, metaphorically speaking. Listening for certain sounds should and does take some active attention, and he doesn’t just “see” her there. I’m thinking this would be especially true for his own apartment. In an environment he’s intimately familiar with, he wouldn’t have to focus his senses as much as he would in an unfamiliar environment. That, of course, makes it even more likely he’ll miss something. The most obvious thing this episode is what happens at Melvin’s workshop. Of course, we know from last season that this place is full of goodies, including Stilt-Man’s legs! Now, it seems like Melvin is working on something that may lead him to the Gladiator down the line. I kind of hope they leave this one alone, the Melvin character is fine just the way he is, but the little teases are perfect. In this episode, we see Melvin show Daredevil his new body armor which carries the familiar pattern from the comics. Matt subtly avoids commenting on it, but I very much doubt he’d have any idea what he was looking at – or the significance of it – even if he could see it. This one is for the fans. This is another episode I’m going to have to give to Frank Castle. Not only is he able to endure a ridiculous amount of pain, which I have to admit is impressive, he also shows a very human side this episode. He can’t stand the idea of his dog being tortured, and the story he tells Matt about his family just breaks your heart. There was a time when life had something very different in store for Frank, and it’s is incredibly sad that he was robbed of that future. Jon Bernthal does an amazing job with this character here. This is the second in my series of posts looking at some of Andy Diggle’s previous work, in light of his taking over Daredevil in September. When they are leaving Josie’s and Foggy heads out into the rain with a newspaper over his head, I want to start singing “Over at the Frankenstein Place” from Rocky Horror. I can’t wait for your review of episode 5 which was my favorite. 🙂 I love all of them but I have watched episode 5 a heck of a lot more than the rest. When Matt walked into his apartment and didn’t sense Electra right away I also liked that it showed they’re not treating Matt’s senses as infallible, or to take it a step further – Matt’s use of his senses. I think if he had been paying attention he would have sensed her, but he was having a happy moment for once and it distracted him. For such a small scene it really said a lot about the push and pull of his two lives. I like your take on Daredevil giving Brett the arrest. I hadn’t made that connection of bending the system to preserve it and it being a little bit of Punisher influence. I like that. Warning: this will be a little bit spoilery for later in the season, but not too bad for anyone who saw the previews and made some assumptions. Brett taking credit for the arrest bugged me a bit. Although it was nice seeing him get praised because he is a good guy; he basically took a bribe, which doesn’t match his honest cop character. He was able to arrest Fisk last time while sharing the credit with DD. Keeping the credit when unearned seemed out of character. I was pleased to confirm my interpretation of the scene with Elektra. Some people said while watching the preview that they thought she’d thrown a katana at him and he’d caught it in mid air, but I thought that he had grabbed a knife from the counter when startled that she was there. Also was glad to confirm that was Karen sneaking up to the house. I was happy to see the romantic scene, and glad that they didn’t have the oh so annoying love triangle, at least the Foggy/Karen/Matt version. The Elektra/Matt/Karen one was inevitable as soon as they announced Elektra was going to be in the series. And of course the Matt/Karen romance was doomed since it was so early in the season. I was glad to see Father Fantom again, although I thought his guilt advice was a bit strange. I expected him to include at least a touch of “just don’t take it too far” since he was a practical person. (And Catholic guilt is such a well known thing.) I was disappointed not to see more of him this season, but not surprised since they were cramming in a lot of story in a limited number of episodes. He wouldn’t really blend with ninjas. I’m keeping count of how many times Brett Mahoney says, “AmbuLANCE.” Cracks me up. OMG, Donna, me too! It’s my season 2 drinking game! Agreed that this was one of the best of the series. That scene in the graveyard is just amazing. Bernthal makes you forget that he’s a psychotic killer and breaks your heart. Matt and Karen. I know I’m repetitive in the way a describe things, but if you don’t think they have chemistry, then you don’t know what chemistry means. Cox and Woll are on fire together even when standing in the rain 🙂 And thank God they didn’t go the love triangle route. I’m getting ahead here but its immensely impressive how much chemistry Matt and Elektra have when she shows up that it almost eclipses the heat between Matt and Karen in these early episodes.. I wondered about Matt not sensing Elektra right away myself. I think the show has done a good job of showing that Matt can lose focus and be distracted easily. There are future scenes that especially show this where he is focused on one thing and misses others. or some where he is focused that he blocks out the rest of world intentionally. A big theme of the whole season is Matt not focusing on everything he needs to and only on what he wants to or believes he needs to. Thats how i read the scene on my second watch. Matt’s thoughts were so focused on Karen he wasn’t paying attention to anything as he entered his apartment. I said this before, but I absolutely agree that Melvin should stay as he is. I like the easter eggs we’ve gotten in his shop, but I actually don’t want to ever see Gladiator. There are more than enough villains to mine for this series, especially since Kingpin and The Hand are likely going to be the main antagonists throughout. I have a Daredevil question… I’m thoroughly enjoying these reviews and comments. I’ve been devouring the back blogs to catch up to present. I grew up on Spider-Man, Stan Lee was a household name for me as a kid and I did enjoyed when Daredevil crossed over to Spidey’s world. This made me familiar with Kingpin, Electra, Melvin and the origin of Daredevil so when the Netflix series arrived I knew what was coming. It exceeded my expectations mostly because of the Spider-Man films that were good but could have been so much better, and the Daredevil film that was not so good. So now with Netflix I am immersing myself in Daredevil because the series is so good and I’m playing catch up. I read the comic compilation, “The Man Without Fear” and loved it. Can you recommend other particular Daredevil compilations? I predict Netflix and Marvel will go darker in season 3 and play with Matt Murdock’s struggle with his sanity. Is there a particular story line I can read about that? Thanks for your help. You will want to read Frank Millers Born Again trade paperback. Given what you say here it should be everything you are looking for. @Sarahnova I agree. One of these days, I’ll put together a mega post on all such moments (I have all the ones I found in the first season in an Excel file already). Holy crap Bernthal was amazing in this episode!! He nailed the Punisher in so many different ways and his performance was exceptional. They were able to make Frank so sympathetic and complex, if his story didn’t break your heart I don’t know what would. It was really touching stuff. I love how they went beyond the simple fact that Frank kills and Matt doesn’t and they don’t like each other the end. There is a mutual respect between the two men that starts here. They don’t see eye to eye but they can understand where the other one is coming from, and I cheered when they worked together to escape the Irish Mob, especially when Matt stopped Frank from killing and Frank calls him a choir boy. There is a lot of deep phycology going on here. Matt and Frank are a lot closer to being one another then they want to admit, and Im glad the show delved into that some. I also loved the symmetry between Frank and Elektra. Matt tried his best to save both their souls, but Frank was just to far gone. Just really good character driven storytelling! But this was just such a strong well acted episode. It served as the conclusion to the first arc in the season and set up the start of the next story. And ohh that wonderful cliffhanger! Two thumbs up for Bernthal! Really good stuff from him. He left his dog behind!? I don’t think Matt and Karen have chemistry. Real chemistry at least. What I see is its set up to be romantic. You have lights, music, atmosphere – all the things you need to set up the perfect moment but no real chemistry or heat there. The heat in the scene is just because Charlie is just a really charming guy. Now compare that to season 1’s kiss in the kitchen or when Claire is patching him up. The scene is bare, raw. Nothing about it screams “romantic” and yet it is. Its white hot. You are seeing two people baring themselves – equally wounded and searching for connection. When he says his name to her, its almost as good as a kiss. That’s the emotion that powers the scene and the chemistry. You can almost feel the need there. No lights, no rain and atmosphere to enhance the scene because its inherently there. There’s honesty between Matt and Claire that isn’t in the relationship between Karen and Matt because fundamentally their relationship is built on lies. When Matt and Claire talk to each other in the hospital later in the season, there’s lingering emotions in their meeting that you can read between the lines and the body language. Claire is gentle as always but Matt is standoffish and distant. He’s putting up an emotional wall as if her being there opens up wounds. 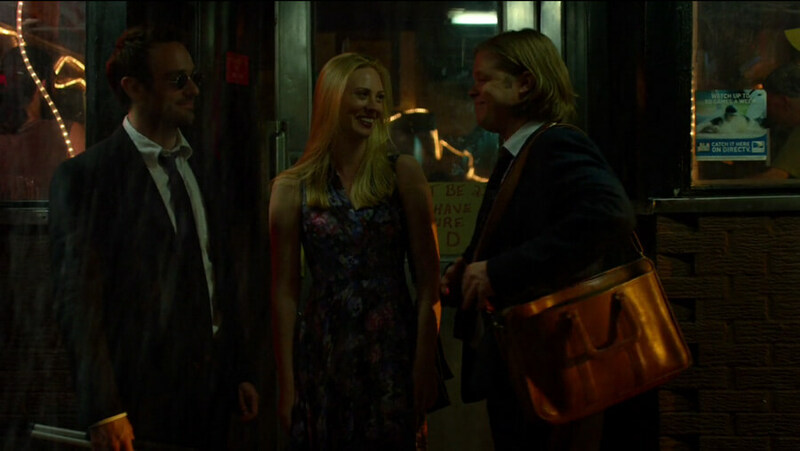 My complain this season was there was just too much Karen Page even in episodes where she didn’t need to be there and very little of Claire who I think is fantastic as always and really deserves a full on episode or two to shine. a very simple, very cool, and very accurate description of a viewpoint of chemistry in the post above.. bravo.. if it is truly there then so it also is, naturally, evident..i like..
but let’s at least try to not (unintentionally) put words in other mouths.. understood that it is a difficult thing when it comes to basic emotion and instinct to control not getting too blurred as to exactly what it is that we are heareading..
granted he initially made a somewhat gross over generalization.. “not knowing what’s what” based upon the state of a single relation.. but..
the poor guy only mentioned it once here (even if has repetitively it still is only one thing), and is entitled to do so (although agree less definitive absolution and more discretion is best)..
and he did actually say “even when” standing in rain.. no mention of lights, music, atmosphere (which has to actually be there to begin with), etc.. and cox is the same guy in both.. and let’s remember that these are in reality actors (and quite capable ones) so things may not always be as they seemingly are being played out, and this usually on purpose(s)..
at any rate, i really enjoyed your view on this subject.. dawson is as apt as she is nice (mick jagger lips and all).. and everyone else’s as well .. holy cow, even more than the episode itself, i think… especially the exclamation marks after the “dog!” haha..
now the.. “girl!”.. and who and how many are left hurting..